Well, actually, they didn't play my song. But it wasn't for lack of trying. The memory is a little cloudy these days but I think the story goes a little something like this. I'd gotten my driver's license in the spring of 1970. I'd cut it close, failing in my first attempt because I went over the speed limit. It would be a habit I would keep the rest of my life. So I took the test again, just in time for my then-girlfriend's high school graduation dance. Fast forward to the fall. I'd gotten into the habit of going out cruising in Dad's car with my fiends. You know. Tooling around town listening to the local radio. Scarfing down some cheeseburgers at A&W. We weren't getting into any trouble. And we weren't picking up chicks. 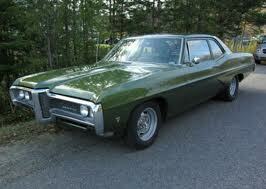 Actually, you can't really pick up chicks in a four-door, cream-coloured, 1968 Pontiac Strato Chief. Not exactly a babe magnet. Believe me, I know. and this is a Parisienne and his was a Strato Chief. Same year, though. Okay, so close. Anyway, one early winter's evening me and the guys, Paul, Gary - who's Rolling Stones "High Tides, Green Grasses" LP I still have to this day - and his brother, who's name escapes me were cruising around town, listening to the hits on the radio when one of us - I can't recall who, but I'm sure it couldn't have been me - got it into our heads that we should drive out to the radio station and request a song. Okay, cool. Let's go. And we did. Now the radio station was in an old house in the west end of the city, a quiet part of town. (Oddly enough I would work in the newsroom of this radio station seven years later.) We turned off the street and started to drive around the wide circular drive at the side of the house. There was a bit of a slope to the drive and we started to slip backwards in the freshly fallen snow. Now, at about the same time I thought it would be a good idea to back up and take another run at the driveway, Gary's brother also had an epiphany, unfortunately unrelated to mine. He thought now was the time to knock on the station's door and request our song. So he flung open the back seat passenger door and was about to bound out and up the steps when - CRASH - the rear door broke off the car. Well it didn't actually break; it sounded like it, but it did get all bent out of shape. To say nothing of me at the wheel shouting expletive deleteds at Gary's nameless brother. Although, there were a few names I used that were so much better than his God-given name, whatever it was. Oh, and the song we were going to request, and never did? Should have listened to Mama - and Three Dog Night! Which is nothing compared to what Dad told me when I got home. "Sunday Funnies", which would normally be posted here today can be found over on my other blog dufus daze. Check it out. Instead of cruisin, you got a bruisin from dear ol Dad. I just watched the video. Those are some wild fashions we had. How did we go from that to jeans around the knees? Well we went through puffy shoulders, skin-tight pants and big hair in the 80s before we got to "pants on the ground". Imagine. Didn't you have telephones in those days to call in and request songs? :) Could have saved you all the trouble. Hindsight's a wonderful thing. But you see we were out cruisin' and the radio station gave us a destination, much neater than a phone booth. Hell, you couldn't even talk back then. Things have sure changed, eh? HA HA HA that is AWESOME! BAD! TERRIBLE! But an awesome story. That car in today's standards would be a pretty rocking ride. At least in my book! It was a great car. And it was back in the day of not having to wear seat belts. I don't know what that has to do with anything, but I just remembered it. Awesome story! Dontcha just love how the teenage mind works? or doesn't as the case may be. Oh and I loved Three Dog Night. Did you find this story had a bait of an American Graffiti feel to it? Kind of like Ottawa Bad Penmanship? No? Gary's brother was a tad slow from time to time. Unfortunately this wasn't one of them. In truth my father took it remarkably well. I was surprised. So was Gary's brother. It's amazing, sometimes, the things teenagers do. Having been there there's little my kids did that surprised me. Still annoyed me but didn't surprise me. So funny, and the song you didn't get to request was so appropriate. Yep, mama usually knows best. Not that we would have admitted it back then. You know, I never really liked that song after that. How funny in a "so sorry for your dad's car" sort of way. That really takes me back as well. I was a senior in high school in 1970. My boyfriend wouldn't have been cruising around picking up chicks as he was in the army in Ft. Polk, LA and we were engaged to get married the following fall. That year we bought a 1970 Chevy Caprice that is not too different than the car in the picture...if you close one eye and squint. I think I still have that album. Oh Dufus. You were a typical rebel son. heh heh. Love that song! Ugh. Sorry to hijack this thread... but yesterday and today I tried to leave comments on DufusDaze and it keeps making me fill out another form with my quirkyloon addy and password...which according to them is WRONG. It's not. And now? It has made me very angry. These things happen, right? I bet your dad didn't say that though. Sorry for the late comment - Family crisis today. Those were big clunky cars back then, weren't they. My Dad has a Fury III after that car. A huge boat. Oh, you don't know the half of it. I was a terror from 12 through 15 or so. But that's another tale for another time. That's weird, Quirky. It's usually the comment system on this blog that's wonky from time to time. Sorry about that. He was upset but oddly enough somewhat serene about it all. I wasn't punished at all. Ha, ha, great observation, Ziva! Ah the novelty of having to WAIT for your song to come on or dammit, drive down to the radio station and request it. Mike! What the hell happened to you today? Remember the scene from American Graffiti when Richard Dreyfus calls the Wolfman at the radio station? This was kinda like that but there was no blonde in a T-bird involved...unfortunately. I loved that song! And I loved TDN. Funny story. Kids are crazy! 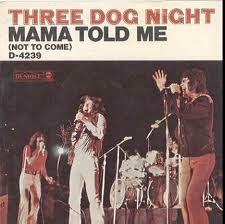 Of all the 3 Dog Night songs to request, it was 'Mama'? That's funny in and of itself. Okay, so you were just a kid and you get a pass on the song. Since your dad didn't actually kill you, you kinda got a pass from him too, no? I tell what I love about this post -- besides the great joke at the end -- and it's this: It reminds of those days when there wasn't anything more fun than cruising around town all night doing stupid, or nothing at all, with your friends. To this day, they stand out as some of the best, most carefree times of my life. Yeah, Three Dog Night, The Doobie Brothers, Blood Sweat and Tears all belonged to a certain time and space in my life. I liked them too. Yeah, oddly enough I lived to tell the tale. I enjoyed your post, too. Yeah it really was a special time with special friends and we all thought we'd be immortal. Paul was my best man in 72 but then we lost touch. Gary passed away a couple of years ago and I hadn't seen him since we were kids. I have no idea what happened to what's his name. I'm too young to know that song. Must look it up on Youtube....pffftt...you're not buying this are you? Thanks, Sandra. Sorry about the Miss Manitoba Bikini thing. You should have won against that skank. Well I'm sorry I've been unable to leave a comment. :( Oh well. It's probably me. And yes I'm in major pity party mode. It's not you Quirky. It's my blog. Oh my goodness - I *puffy-heart* Three Dog Night! Yeah, they were kinda cool. I have an album or two of theirs.